The past two weeks, I found myself swamped with material, nonfood related, mind you … something more crucial. I got caught up digesting it \m/ (Pun intended). So there, the reason for the inactivity on this page … because my foodie lovies and I never really do stop eatsploring. When I turned to the page with the fried rice platters, however, the Thai bagoong rice sounding dish was the loudest to shout “pick me”. =b While we ended up with two appetizers, the grilled scallops and sinuglaw, as ulam in our meal, the tender humba served on top of the rice, was also the perfect accompaniment. It was the most flavorful element of the dish. =D The fried rice was a heaping serving, though I would’ve wanted more toppings on it as well. Most especially, the mango strips … that was just a fraction of a green mango. Nyum, those grilled scallops! Even if it was the first dish served to us, I saved two to eat at the end of the meal for its deeelicious cheesy butter topping. And the scallops themselves, oh, sweet, sweet scallops. Tanigue as a ceviche was well made. Not fishy at all. ^^, What a zingy mix with minced tomatoes, bell peppers, finger chilies, and black beans (for a twist in texture) that also worked great as an entree. The grilled meat, totally smoky barbeque flavor and soft. We also had fun with the couple of deep fried leaves garnish. Kangkong, we’re guessing, that was. X marks Kuya J Restaurant for good food in Baguio. Everything we had while hanging out at Kuya J’s so far was awesome. It’s a given that we’ll be back one of these days to “tambay” again and try the other interesting things Kuya J has to offer. At last we can eat at Kuya J now. I wait for your reviews before going to a new restaurant 🙂 I thank you for keeping us informed so we can also have a food adventure. I love love LOVE Find Good Baguio Foods blog!!! I actually saw space for Kuya J being renovated and I am happy to hear through your review here na it’s open. Next resto to visit. 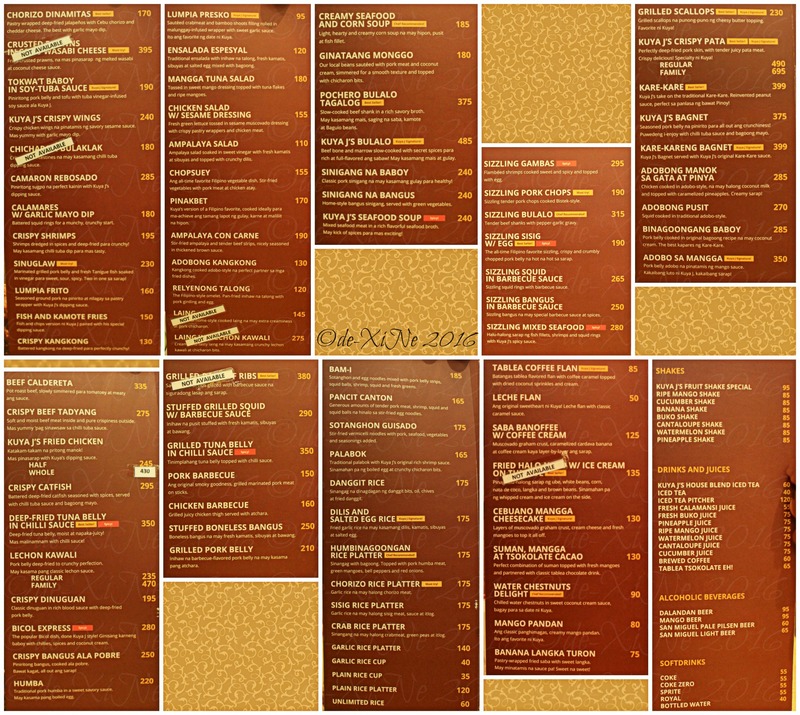 I have so manyrestos in my list now because of this food quest blog. Thank you. God bless X! Nabuhay ang blog na iteyyy!!!!! At Kuya J naman ang napuntahan. Andun ba si Echo? Hello, Mario! *hihi yes, got through the lazy to post bug. Unfortunately, the live Jericho was nowhere in sight when we were at Kuya J (his face was everywhere though – on the “loose leaf” menu =b). Maybe at their “grand” opening? … if that’s not done yet.